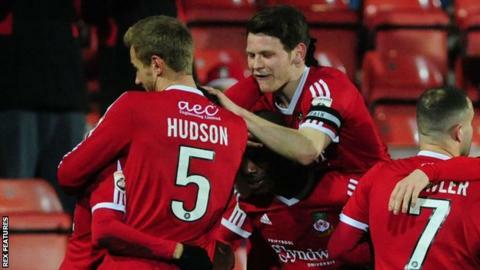 Wrexham extended their unbeaten record to six games with victory over Kidderminster Harriers. Manager Gary Mills is confident Wrexham can maintain their position in the National League play-offs. Wrexham are in the top five for the first time since December after a 2-0 home win over Kidderminster. Kayden Jackson's two goals saw the Dragons secure their third successive win to move up to fourth. "We've got ourselves in the top five with a lot of hard work and there has got to be a lot of hard work to stay there," Mills said. Mills' side, who are away to Macclesfield on Saturday, moved above Gateshead and Tranmere Rovers following victory over struggling Harriers. Gateshead and Rovers have a game in hand over Wrexham while seventh-placed Dover have played four games less than the Dragons but Mills is focused solely on his side. "Teams have got games in hand but if we win again on Saturday we stay fourth," Mills added. "We've got ourselves in there and given ourselves hope that was maybe dwindling away not too long ago. "We'll keep plugging away and keep working hard."